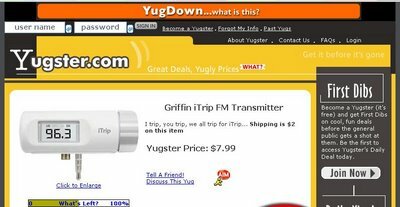 Deal site Yugster has a similar model to its better known rival, Woot. Like Woot, Yugster sells one product a day at low prices until it is sold out. 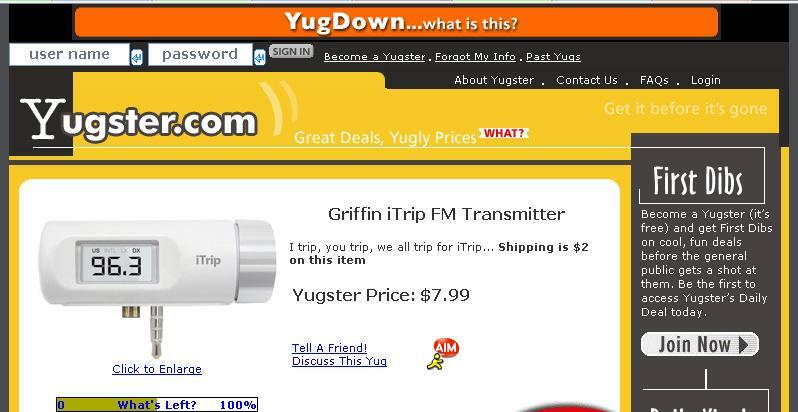 Right now, a Griffin iTrip FM Transmitter that also plugs into an iPod is for sale for $7.99. It looks like something called a Yugdown is going on currently so instead of listing one deal a day, a new deal will go up once the current one is sold out. They must really need to move some inventory. As far as site design, Yugster looks a little more rundown than Woot, but features more bells and whistles like mouseover descriptions. Disappointingly, Yugster is missing Woot's delightfully voyeuristic product stats, which breakdown sales stats by the hour and give you a little insight into who else is buying the product.